Hydra-Cell T80100 pumps are designed to replace horizontal multi-stage centrifugal pumps and packed plunger pumps in oil and gas applications. The pump offers flow rates up to 96 gpm (3300 barrels per day; 366.1 l/min) at pressures up to 1500 psi (103 bar). 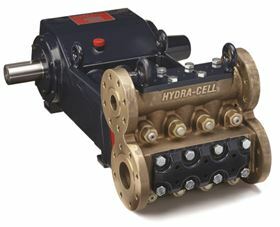 Hydra-Cell T80100 pumps are 'packing-free' and designed to replace horizontal multi-stage centrifugal pumps and packed plunger pumps in oil and gas applications. Featuring a seal-less, multiple-diaphragm design, T80100 pumps eliminate hazardous VOC emissions and clean-up and disposal costs of packed-pump leakage. The design also eliminates the need for external lubrication and maintenance as well as plunger wear problems associated with packing. In addition to zero leakage, T80100 Series pumps can run dry without damage, will operate with a closed or blocked suction line, and can pump abrasive fluids effectively. These performance features enable the T80100 pumps to compete with conventional plunger pumps by offering a lower cost of ownership, reducing maintenance needs, and providing a longer service life, Wanner reports. “Wanner Engineering believes so strongly in our new model T80100, that we have instituted a unique beta program for the first customers of the pump,” says John Wanner, VP of New Product Development. The T80100 is available exclusively in North America.